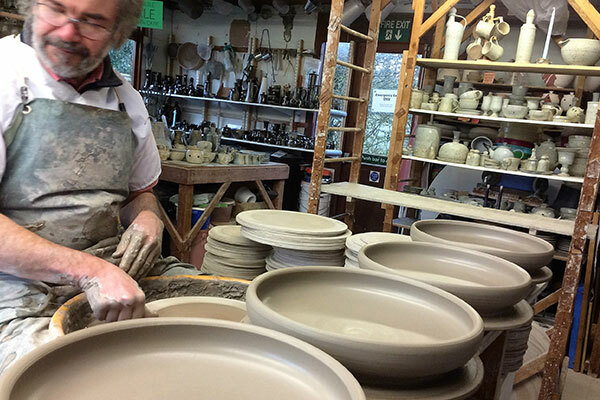 Malcolm offers pottery lessons for those wishing to learn to ‘throw’ pots on the potter’s wheel. A session of intensive tuition lasts three hours, and takes place on weekdays (mornings or afternoons). Two electric wheels are available, therefore, two people can share the experience and the cost! Please email: [email protected] , to book tuition or to buy a lesson gift voucher. Visitors are also welcome in the workshop to see what’s going on, and to browse through the gallery area, where a large range of finished pottery is displayed. Opening times are: normal weekdays, 9am-1 pm, and 2pm-6pm. This entry was posted on September 21, 2016 by jasonhubbard.